Our product range includes a wide range of on site balancing services, vibration consultancy and laser alignment service. We provide a complete range of on-site balancing services of all types of Rotary Machines Like ID/FD Fans, Centrifugal Basket Assemblies, Cooling Tower Fan Assemblies, Turbine Alternators, Fibrin Rotor Assemblies, Etc. Field Balancing of all types of rotating machinery using latest portable instruments. On-site balancing provides a practically efficient method for test facilities, assembly and plant maintenance to balanced completely rotor assembly in position avoiding disassembly of your equipment, cost of transport, labour and down time. We follow over-all vibration measurement in accordance with IS : 11274, ISO 2372, BS 4675 or VDE 2056 Standard Specifications. We have experienced engineers who conduct such services regularly all over India. Pharmafill technologies offers a complete range of services to diagnose, troubleshoot and correct machine condition regularly as well as annual maintenance contract (AMC). Perfect vibration analysis can be the most valuable tools for predictive and preventive maintenance which will determine the healthy condition of the machine. 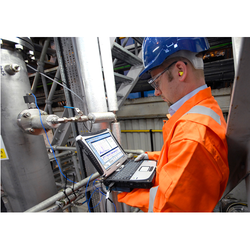 Under AMC we carry out condition Monitoring on Equipment and submit detailed report along-with our recommendation. Based on which, further plan for Analysis, required rectications and Balancing are decided. Also we can provide FFT chart and Spectrums on your demand. We provide Condition Monitoring, Vibration Consultancy Services All over India For our various Clients. We offer a complete range of services for Laser Alignment for all types of Rotating Machines in Horizontal, vertical/range-mounted and Cardan-shaft-Couplet drive. We have an instrument with program feature to undertake Alignment Jobs. Correct Alignment helps to prevent Vibration, Machine breaks down, Production loss, Bearing failure etc. We are providing regular alignment & Vibration Consultancy Services for all over India. We have modern Tools to carry out such jobs on Pumps, Motors, Alternators, Cooling Tower Assembly, Turbines, Spindles, etc,. We render these Services for Various Clients all over India and abroad. Perfectly aligned Machines reduce vibration, Machine breakdown, Production loss, Energy consumption, failure of Bearings and other parts, Coupling wear, Shaft Breakage. The ultimate advantage being Long and trouble free machine performance.